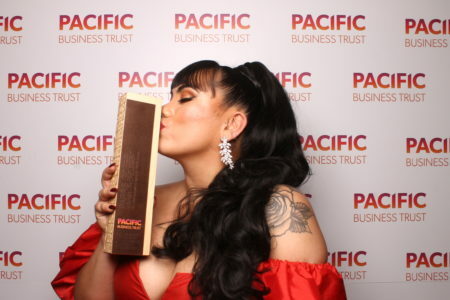 Parris Goebel was the proud recipient of the inaugural Pacific Business Trust Legacy Award recently. Photo supplied. Be Fearless, says the internationally renowned choreographer, dancer, director and businesswoman Parris Goebel who was the recipient of the inaugural Pacific Business Trust Legacy Award at the National Pacific Business Trust Awards held recently at Eden Park. The sought-after music-video director attributes her success to her father Brett, as well as to her Pacific heritage. The Legacy Award was presented to the dancing diva by Carmel Sepuloni, Minister for Social Development and Disability Issues, Associate Minister for Arts, Culture and Heritage and Pacific Peoples. “This recipient has already made her mark on the global stage of her chosen profession. We could not think of a better Pacific person to honour as the inaugural recipient,” said Ms Sepuloni. Offering advice for upcoming Pacific entrepreneurs, Parris said, “It’s our time to shine, we have this raw energy within us that people recognise and celebrate when we show it.